Easter has just passed by and I seem to have reached critical mass with a number of little bits of news about what is happening in my world. So here is one of those occasional news round-up type posts of mine. I’ve been pretty busy down at Bolton Little Theatre in the last few months. We had an extremely successful screening of The Rocky Horror Picture Show with plenty of the audience in costume and some wild behaviour in the aisles! I must admit I was pretty nervous how this night was going to play, so it was a big relief to hear our guests leaving in high spirits and some lovely feedback on the night. We’ll be showing Dirty Dancing on Saturday evening 9th June 2018. Visit the BLT website for tickets and more details. But my main job in the last few months has been as sound designer and operator for various productions on both of our stages. Absurd Person Singular by Alan Ayckbourn was a particular challenge, requiring party sounds every time the kitchen door was opened, and that door gets used an awful lot. Another tricky part was that each act opened with a Seventies Christmas pop song, which faded from normal to mimicking the tinny sound coming from an onset radio. But I pulled that off and this brilliant play about materialism and self-delusion was brilliantly acted by an excellent cast. I thought it was one of our best productions in a while. Although The Pitmen Painters by Lee Hall, which I was only tangentially involved with, was every bit as good in every department. With all this tech work, and editing a monthly BLT newsletter, there has been a knock on effect on my writing but I’m becoming more productive now with a couple of projects. One I can’t discuss yet but hopefully might turn into my biggest theatrical script yet. The other is a short video about my love for Michael Mann’s 1983 horror movie The Keep. I am currently writing the script. This will be the second in a new series Westlake Films is producing. The first episode, in which Carl Bowler rhapsodies about Scott Pilgrim vs The World, has just been released online. Carl does an excellent job in praising what makes the cult comic strip adaptation tick and how it links with his own life. You can find it on Westlake Films’ Youtube channel. Or indeed, right here! My fellow writer Rik Hoskin has had several exciting projects published lately. His marvellous six-part SF comic Red Rising: Sons of Ares has been collected into a handsome graphic novel. Based on the hit YA series Red Rising by Pierce Brown, the comic tells of the origins of resistance leader Fitchner Au Barca. Born as a Gold, one of the ruling class of a brutal future human solar empire, the misfit Fitchner soon recognises the cruelty of the system. To protect his secret wife and son, who come from the lowest caste, Fitchner’s fight against the Empire leads to tragedy and the seeds of a rebellion. The artwork is engrossing and Rik’s storytelling skills are well in evidence. Speaking of graphic novels, the sequel to the New York Times bestseller White Sands, which was also written by Brandon Sanderson and Rik Hoskin, is out now. White Sands Volume Two continues the adventures of a young magician on an alien world where sand can be magically wielded to create and destroy. It is adapted from an unpublished manuscript of Sanderson’s and is a part of his Cosmere universe. Both this and Red Rising: Sons of Ares are published by Dynamite Comics. Outlanders may have concluded but Rik is now involved with a new series of action novels – SEAL Team Six, alongside Max Kent. It depicts the all action secret missions of a group of Navy SEALS – the proverbial best of the best of the best. Executive Order sees them dispatched to track down a ruthless ISIS group which has got its hands on US drone technology. I’m currently reading it and it’s great entertainment. I’m delighted to learn that the first run of comics featuring were-coyote Mercy Thompson has been collected together into one hardback volume. 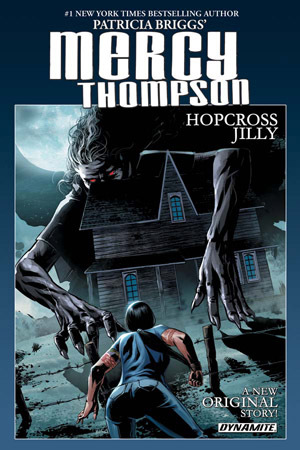 Based on the popular series of horror-fantasy novels by Patricia Briggs, this series has been written by my good friend and in-demand comics scribe Rik Hoskin, based on a storyline by Briggs. Illustrated with marvelous artwork by Tom Garcia. Mercy Thompson is a beautiful young woman by day, and coyote and honorary member of the Tri-State werewolf clan by night. When the pack uncover a mass grave of children’s skeletons, it leads her into conflict with a terrifying supernatural being. Worse, Mercy’s stepdaughter Jesse is now endangered. In addition to the comic strip, this collection also includes Rik’s original script for issue one, which is interesting reading for writers like me wanting to more about how storytelling works in such a visual medium and how it is formatted. Recommended reading!